Someone's tried to bring down the Chief Justice of the United States, a web of lies we're told, and in comes Nick Heller to dig into the dirt to expose the truth. A fine start to a thriller, and author Joseph Finder leads his reader in like a roller coaster climbing lazily to the top of a hill that won't be seen until you've crested it. The novel is a bit of a roller coaster ride, with a bit of excitement at the beginning that is just the beginning. The issue with the potential scandal is quickly dispelled, but that only sends the reader deeper into a more involved scenario with far greater complexity. There are plenty of twists and turns to the narrative as Nick Heller probes beyond the surface question and tries to uncover the real actors who put the scandal into motion, to uncover their motives. Without getting himself killed, of course. That's what a thriller is all about, after all, creating scenarios of great danger that build up as the mystery gets closer to solution. Joseph Finder does this sort of thing quite well, with tight prose that never falls off into the hard-boiled realm. There are plenty of techie gadgets and electronic snooping that appear without intruding, the purpose explained just enough to let you know what the device will do, and then what it will not do when the intrepid investigator lands in another tight squeeze. How can I say more about the plot without giving things away? Let's just say that the action takes place largely in the Washington, D.C. area, some high-powered people are involved in a devious plot that is more intricate than first appears, and the protagonist develops a relationship with the woman journalist who thought she had the scoop of her life when she was handed the story about the morally righteous Chief Justice enjoying the services of a high-priced call girl. The novel has all the elements you look for in bit of fiction that is designed to engage a reader. 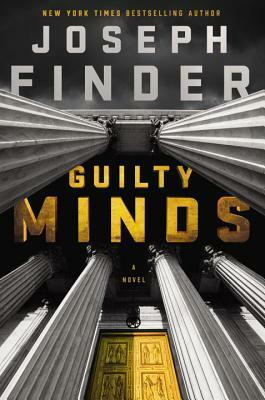 GUILTY MINDS makes for the perfect summer read, a thrill ride that satisfies a craving for something light, entertaining, and well-written.